Aquamarine is a lovely blue gem, reminiscent of the sea. In fact, the name is derived from Latin terms, “Aqua” for water, and “Mare” for the sea. In ancient times, it was believed that Aquamarines were a gift from the god Neptune (the God of the Sea), and that these gems were good luck for sailors. Today, Aquamarines are associated with hope, youth, fidelity, and health. Aquamarines come in several shades of blue, from light to dark, all equally striking. These are also naturally very clean stones, usually completely free of internal inclusions. Aquamarines are generally affordable, with the exception of the larger and more intensely blue stones, which can be very pricey. 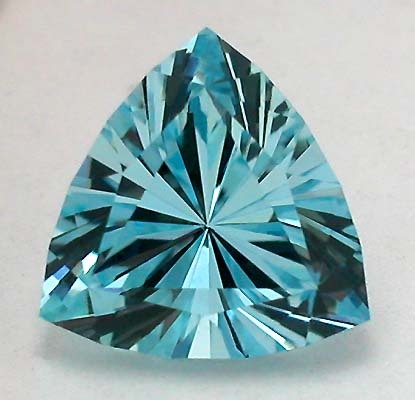 The best and most important Aquamarine mine is in Brazil. Other sources for these beautiful gems are Afghanistan, Madagascar, Mozambique, Nigeria, and Pakistan. The alternate birthstone for March is the much more masculine Bloodstone. Bloodstone is green jasper, sprinkled with red iron oxide. This stone is also known as Heliotrope, perhaps because the ancients felt that it looked like the sun setting over the ocean. Ancient Christians believed this to be a Martyr’s stone. They felt that the stone’s appearance symbolized Christ’s blood falling on the jasper that was at the bottom of the crucifix. The ancient’s would carve bloodstone to reflect such biblical scenes. Examples of carved Bloodstone can be found at the Louvre in Paris. Bloodstone mining is done in India, Australia, and the United States. Despite the large amount of production, fine bloodstone is very difficult to find in today’s market. Medium-quality bloodstone is widely available, and very affordable.